Duke freshman forward Zion Williamson made official what everyone long expected when he announced his intentions to enter the 2019 NBA Draft on Monday afternoon. "Thank you for making this year the best year of my life," Williamson said in a video message to Duke as he officially declared for the Draft. "I don't think I can put into words how special this year was. Everything about this team was special. Learning from Coach K was special. He taught me so much about the game of basketball in one year, it made me sit back and go 'wow, I didn't know anything.'" Williamson, a 6-foot-7, 285 pound thundering forward, is expected to be the No. 1 pick in this year's draft. Ahead of the pre-draft process in his lone season with the Blue Devils, he wowed with flash and finesse, the likes of which the college game has rarely seen. He was awarded Naismith and AP Player of the Year honors while posting averages of 22.6 points, 8.9 rebounds and 2.1 steals per game. 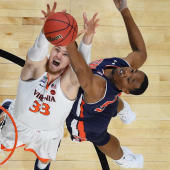 Williamson was an AP first-team All-America selection along with teammate RJ Barrett, who also joins him in taking the one-and-done track from Duke to the NBA. Both were rated top-5 recruits coming out of high school last year. The No. 1 pick in this year's draft will be decided in the NBA Draft Lottery on May 14. The Knicks, Cavaliers and Suns have the best chances at landing the top pick with a 14 percent of being awarded the No. 1 selection. Gary Parrish has Williamson going No. 1 to New York in his latest NBA mock draft. Williamson was Duke's most outstanding player all season and was more than the flash most saw on highlight reels or on social media. Aside from his monstrous dunks and jaw-dropping swatted shots, he was one of the best and most versatile defenders in the sport. Duke lost just thrice when he played one or more minutes in games all season. With new NCAA rule changes, players can hire an agent and return to school so long as they withdraw by midnight on May 29. But with Williamson's surefire draft stock and limitless potential, it's highly unlikely he does anything but stay in the draft and pursue his promising professional career.